Located in the Rocky Mountains on Alberta’s western border, Banff National Park draws visitors from around the world. This UNESCO World Heritage Site is filled with alpine landscapes, mountain lakes, and acre upon acre of unspoiled wilderness. 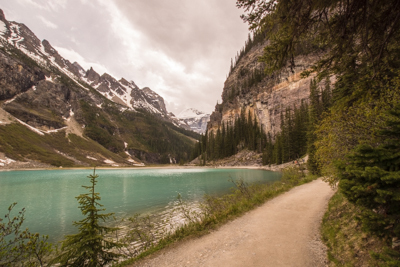 With so much to see, it’s best to have a master plan; so consider basing yourself in the town of Banff, and taking day excursions to the surrounding sites, and even stretching your itinerary past the park’s boundaries. There’s certainly plenty to see and do; and the good news is, most of it is accessible. Banff is a small town, so it’s fairly easy to get around on foot; in fact it’s the preferred way, as parking is at a premium. The sidewalks are wide and level, with curb-cuts at every corner. There are plenty of restaurants and shops to choose from, and although some have a step or two at the entrance, many have a level entrance or elevator access. 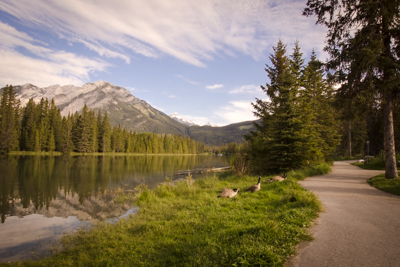 Be sure and save some time to explore the accessible Bow River Trail. The best place to access it is in Central Park, which is at the end of Banff Avenue, near Buffalo Street. There is accessible parking near the Banff Park Museum, located next to Central Park. From there, a level pathway leads out to the paved Bow River Trail, which runs along the length of the river. 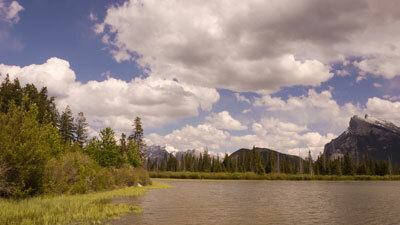 Vermillion Lakes Scenic Drive, located just up the road, is also a must-do. Head out Mount Norquay Road and take the last left before the highway. The road travels past the three Vermilion Lakes, and offers views of the Sundance, Massive, and Fairholme Ranges. There are several places to stop along this three-mile drive, which is a favorite of photographers and bicyclists. For a different view of the area, head over to the Banff Gondola (800-760-6934, www.explorerockies.com/banff-gondola) and take a ride to the top of Sulphur Mountain. The lower station is located at the far end of town, near Upper Hot Spring. There’s plenty of accessible parking near the entrance, with level access to the building, and a barrier-free pathway to the ticket counter. The gondolas, which are 33-inches wide and 44-inches long, can accommodate a manual wheelchair, but scooters and power wheelchairs are prohibited. A loaner wheelchair is available, if your mobility device is too large for the gondola. 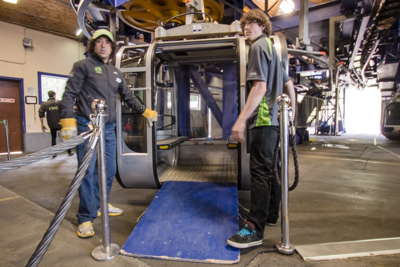 A portable ramp is used for boarding, and they can also slow down or stop the gondola to board passengers who have mobility issues. Eight minutes later, you’re at the mountain station, which features an observation deck, a gift shop and an accessible restroom. There are also two restaurants to choose from, both of which can be accessed by an elevator. The Panorama Restaurant is located on the top floor, and features table service, and a more upscale ambience. The menu offers a nice variety, including a smoked salmon sandwich, some pasta dishes, a stir fry with shrimp or chicken, and beer and wine. The Summit Cafe, which is located just above the observation deck, features more casual fare in a cafeteria setting. Both restaurants offer good access and great views. 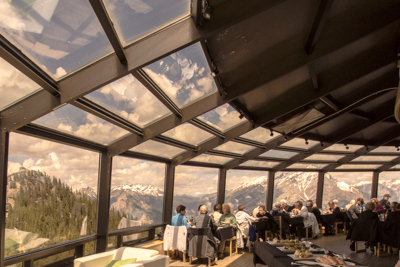 And quite frankly, nothing beats lunch or dinner at the top of Sulphur Mountain. 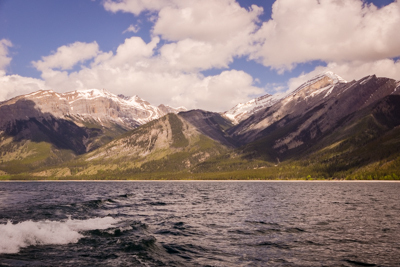 For a day filled with great scenery and wildlife, head over to Lake Minnewanka. Follow Banff Avenue to Mount Norquay Road, drive past the Vermillion Lakes turnoff, cross under the freeway and follow the signs. It’s a 25-minute drive from Banff, however allow yourself extra time, as you’re bound to spot some wildlife along the way. Bear, deer and bighorn sheep are not an uncommon sight alongside the road. Although Lake Minnewanka is very scenic from the shore, you’ll also want to enjoy it on a Banff Lake Cruise (800-760-6934, www.explorerockies.com/minnewanka). There’s accessible parking at the lake, with ramp access down to the boat launch. The ramp is pretty steep, but a free golf cart shuttle is available. From there, it’s a straight level shot over to the ticket office on the dock. 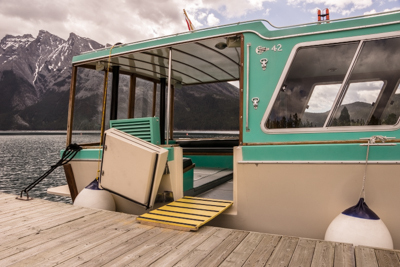 The Minnewanka II has been retrofitted for access, with wide doorways and ramp access. There is a slight lip at the end of the ramp, but the crew is happy to assist. The boat can accommodate manual wheelchairs, power wheelchairs and scooters; and once aboard you can either stay in your own wheelchair or transfer to a bench seat. The staff is happy to work with wheelchair-users and slow walkers. Says Manager Robert Cote, “We encourage people to call our ticket office on the dock directly, at (403) 762-3473, to discuss their access needs.” He also asks folks to make reservations no later than the morning of the cruise, so he can schedule his equipment appropriately. The one-hour narrated cruise focuses on local wildlife, native folklore and geology. You’ll even learn about the evil spirit of the lake that has the power to pluck passengers from boats and pull them down to the lake bottom. After the cruise, continue your drive on Minnewanka Loop, for more great scenery. Slow down, and be on the lookout for bighorn sheep, as they frequent this area. Have your camera ready, as it’s great opportunity to get some close-ups of these sometimes skittish animals. 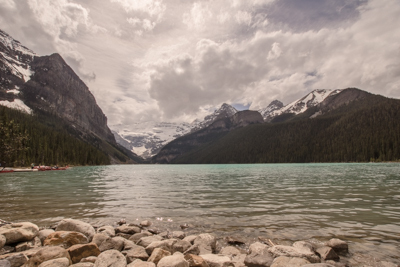 Save one day for a short jaunt to Lake Louise, which is just a 45-minute drive from Banff. Once you get to town, follow Lake Louise Drive past the Fairmont Chateau Lake Louise, and bear left into the parking lot. There’s plenty of accessible parking near the restrooms, with barrier-free access over to the scenic Lakeshore Trail. The massive Fairmont Chateau Lake Louise dominates the east end of the lake, while Fairview Mountain is the major landmark on the south side. The accessible Lakeshore Trail hugs the north shore, and travels about one-and-a-half miles to the end of the lake. The trail begins as a paved path in front of the Fairmont, and gives way to a hard-packed dirt trail as it heads around the lake. About a mile along the trail there is a six-inch wide ditch that is approximately three inches deep. Although it’s not impassable, some people will need assistance there. 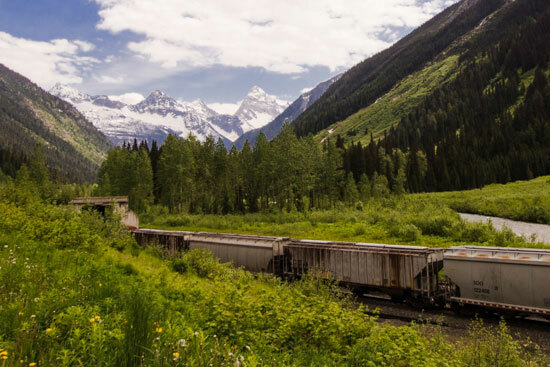 At the end of the lake, you’ll be treated to a view of the Plain of Six Glaciers, but from there on, the trail heads uphill and loses its access. Trail conditions are largely dependent on the weather, and the trail may become slippery after a heavy rain. Still, it’s worth exploring, as the lake views are beautiful, and you can always turn back if things get too muddy. And if you’d just like to take it easy, there are plenty of benches on the east end, so you can just sit and take in the beauty of this magnificent glacial lake. No trip to the area is complete without a visit to the Columbia Icefield, for a drive out on the Athabasca Glacier on a Glacier Adventure Tour (800-760-6934, www.explorerockies.com/columbia-icefield). The tours start at the Glacier Discovery Center, which is located about two-and-a-half hours from Banff, near the border of Banff and Jasper National Parks. This excursion is a very doable day trip from Banff, but get an early start as it will be a full day. The drive out to the Glacier Discovery Center is one of the most scenic routes in Canada, as it passes more than 100 visible glaciers, turquoise lakes and waterfalls. Highlights along the way include Bow Lake, Peyto and Crowfoot Glaciers, Mistaya Canyon and the Weeping Wall. Once you arrive at the Glacier Discovery Center, head over to the first parking lot if you have an accessible placard. If not, you’ll have to continue on to the second parking lot, which is located further from the building. There is level access to the Glacier Discovery Center, where you can buy your ticket for the 80-minute tour. The Glacier Adventure Tour begins with a short bus ride over to the ice coach boarding area. The buses are not lift-equipped, so if you can’t manage the steps into the bus, you will be transferred in a lift-equipped van. 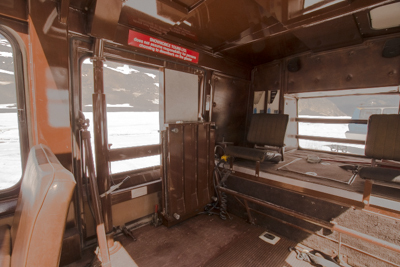 From there, you will board a lift-equipped ice coach with wheelchair tie-downs, for your journey out on the glacier. 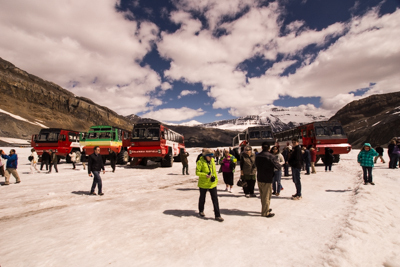 The trip takes about 20 minutes, as the massive ice coach travels down a 32 percent grade, and the driver points out the unique geological features of the glacier. The tour stops mid-way for people to get out and walk or roll on the glacier. Although it’s perfectly safe, slow walkers might want to pack along some snow cleats to avoid slipping. It’s truly a once-in-a-lifetime experience, and a must-do while visiting the Banff area. Plan ahead though and get your tickets early, as this is a very popular summer tour.